Icelandic 4x4 trips are becoming more and more popular in Iceland. Some roads on highland are not open until mid June every year and require 4x4 wheel jeep mostly because of rivers that need to be crossed. The Glacier Rivers can be tricky because in the morning they are innocent but at night they become so big that only the birds can cross over them. If it rain a little creek can turn in to a dangers river. 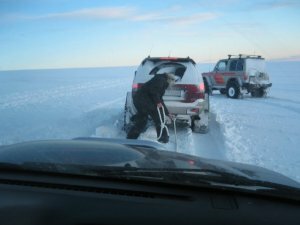 When planning on Icelandic 4x4 wheel trip there are two rules to bear in mind. Newer be alone that is always be in pares 2 or more jeeps. So you can help each other if something happens on your odyssey. It is also good to have someone how knows the right way, have a experienced guide. 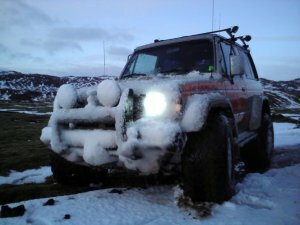 Here are list over most popular Icelandic 4x4 trips you can choose from. Kjolur is the route that lays between the two glacer Langjökull and Hofsjökull. It is very popular excpesaly because in south you have the famus Gullfoss (Goldenfall) and Geysir. Which is a must see when you come to Iceland. In the highland you have Hveravellir which is a weather station and has hot natural pools. Is the shortest road between Akureyri (in North) and Reykjavik. Main obstacles are rivers and glacer streams. The Icelandic 4x4 route Fjallabak (north) is the route north of Hekla and Torfafellsglacer. It is one of the most colerfullrroute in the highland of Iceland. In dry season you can drive any car but it is saver to take a 4x4 driver. Fjallabak south is the route through the desert landscape of the volcanic highlands between Mt. Hekla and the ice caps along the south coast. The route lies to Landmannalaugar were there is a famous hot spring where you can bath in. 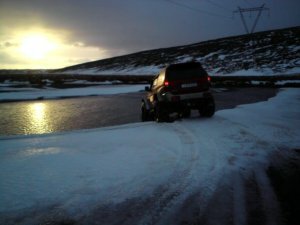 Gaesavotn is not a typical Icelandic 4x4 route; it is one of the most spectacular and adventurous for 4wd vehicles in the country. There are many rivers that have to be crossed. The route takes you about 9 hours to drive between the tourist huts at Nyidalur and Drekagil. The road is so rugged that your speed will be no more than 10 km/h. The route takes you along the northern side of glacier Vatnajokul, the biggest glacier in Europe. The last river to cross on this route has loose sand so you may never stop in the water and you must cross it in the morning before the melding stars. Cold valley is the highest Icelandic 4x4 road in Iceland 727 meter above see. It lies between the mountain Ok and Langjokull. It is only open 3-5 months of the year and it is usually for all vehicle not only 4x4. Fisking lakes are one of the most beautiful places in Iceland. It is a group of lakes that have a lot of fish in them which you can buy fishing license every summer. It is located near Husafell. Lakagigar is 25 km long crater row. It was created during intensive and catastrophic eruption in 1783. It was among the biggest and poisonous lava eruptions of the earth during historical times. The pollution was so great that people in Europe got some of it. Domestic animal and humans died and the population of Iceland went down to 30.000 people. Dyngjufjoll is the biggest lava desert in Iceland. The only way to axes the earia is using a 4x4 car or by hiking. One thing to bear in mind is there is very little or no water so you have to take all your water with you. The Snowy Mountain is the highest freestanding mountain of the country (1833m). It is located north east of Vatnajokull and has many interesting hiking routes. Axes to the mountain is not so difficult from the hut Snaefellsskali. Is famous for bird life, it is the biggest breeding areas for goose, over 7000 pairs. The area is mostly moorland. Is territory east of Vatnajokull. The nature reserve of Lónsöræfi is famous for its spectacular geological and vegetational diversity. 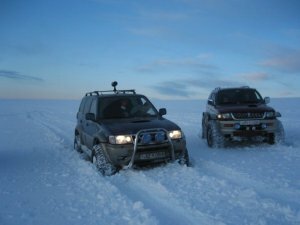 Icelandic 4x4 Glacier trips are coming more popular in Iceland. Both Icelanders and tourist are enjoying this kind of trips. At the Glacier there are no special tracks but you have to follow GPS dot. 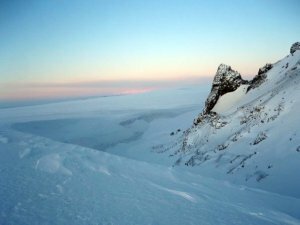 It can be very risky on glaciers because of crevasse.